Soylent Meal Replacement Review – Is It Safe and Healthy? Food brings people together, and the brand Soylent is bringing together a more nutrient-aware and healthful society. The company was founded in 2013 and is currently headquartered in Los Angeles, California. 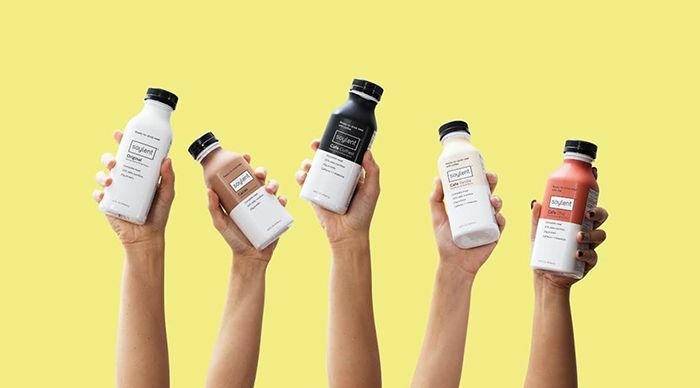 Soylent produces multiple meal replacement options, including two drink types and a powder. 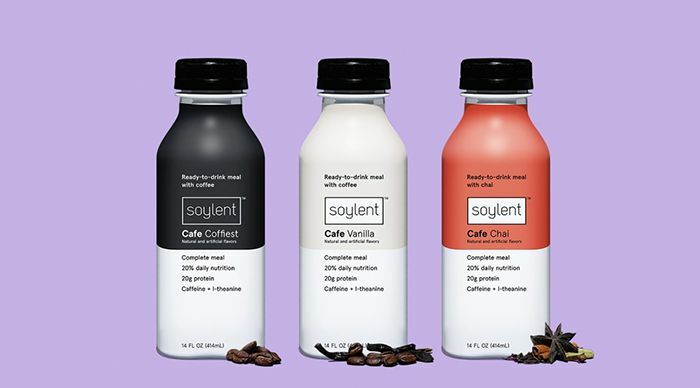 The Soylent drink comes in two flavors, the Soylent café comes in three and the Soylent powder comes in two. All drink options contain 400 calories per 14 oz and 20% of daily nutrient needs based on a 2000 calorie daily intake. Each scoop of powder contains 200 calories composed of important nutrients. These products provide an easy and delicious way to consume important nutrients, whether you are trying to lose weight, keep track of your diet or find a suitable liquid meal option. Read our Soylent meal replacement review to see if this beverage can meet your dietary needs. The Soylent meal replacement drink raises the bar for the various nutrient shakes on the market today. It has a nice taste and texture and contains a healthy level of calories and nutrients. 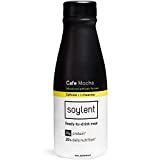 Many people have had success with losing, maintaining or gaining weight using Soylent because the drink provides an easy way to regulate daily dietary intake. The drink should not entirely replace regular meals because it could use some ingredient improvement and as well as additional necessary vitamins. But overall, we recommend the drink to people curious about the occasional meal replacement option. Meal replacement shakes are designed for those who want to regulate how much they consume. There can be many reasons for this. Regulating calorie intake can help with either weight loss or weight gain, depending on the end goal. The liquid nutrition is also suitable for people who need to get in daily calories but are unable to consume solid food in a comfortable manner. Meal replacement shakes are used by people of all ages, including children facing malnutrition, professionals who only have time to eat on the go, cancer patients who have a challenging time with solid food and elderly men and women who must pay special attention to nutrient intake. They are a popular option because they are easy to use. The Soylent options are exceptionally good at including a good mix of nutrients derived from plants. 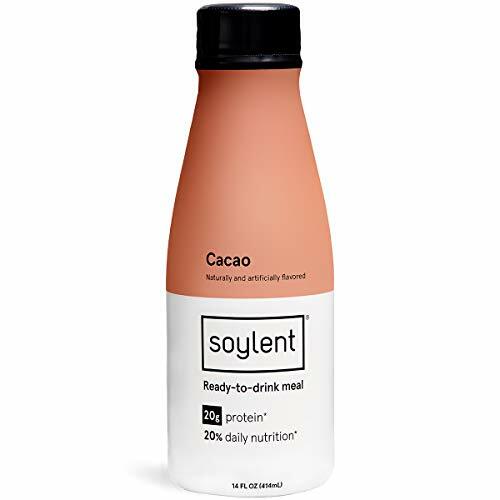 A Soylent meal replacement drink simply needs to be shaken and then twisted open before consumption. The Soylent meal replacement powder is simply mixed with water. Both options can be consumed immediately or stored until lunch or dinner. 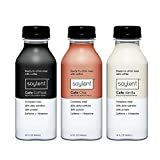 Anyone looking to track her or his daily calorie and nutrient intake can benefit from using Soylent meal replacements. The first step towards significantly changing your weight is evaluating and understanding what you are putting in your body, and Soylent’s transparent marketing makes this easy. 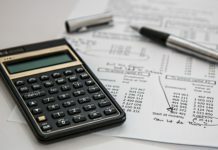 There are many replacement options on the market, and consumers must be cautious when selecting the right one. It is not healthy to replace a meal with something that does not have a good balance of nutrients and will not leave you feeling satisfied throughout the day. Soylent ensures 20% of daily nutrient intake is in each drink and leaves the consumer feeling full and energized. One exceptional benefit of the drink is from where the ingredients are derived. Vegetarians, vegans and individuals with dairy allergies alike can enjoy the Soylent drink because all ingredients are entirely plant-based. Solid food can become a challenge to consume comfortably as individuals age. A tasteful and healthful meal replacement drink is an excellent option to replace one or more meals a day and eliminate some eating discomfort. Elderly individuals share similar benefits as the rest of population using meal replacement drinks in that they can better regulate their weight. Whether trying to lose or gain weight, a replacement drink makes it easier to monitor calorie intake. Additionally, because of the drink’s packaged bottles, it is simple for a caregiver to monitor how much her or his charge is consuming and adjust other meal components as necessary. 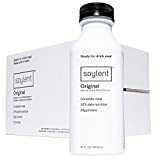 Soylent meal replacement drinks can be purchased in sets of 12 that essentially cost $2.69 per meal. Depending on the location, shipping may even be free. There are two flavor options. Cacao has a chocolate taste, and the Original flavor has a sweet taste similar to soy milk. Both can be mixed with add-ins such as fruits or vegetables. Ingredients composing the drink come from plants such as beets, soy and sunflowers. Together, they provide 37 grams of healthy carbohydrates, 21 grams of lipids and 20 grams of proteins. There are no nuts, animal products or lactose in the beverage. 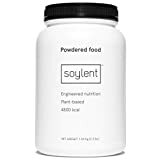 The Soylent meal replacement drink contains plant-based ingredients such as isomaltulose from beets, which is a form of sugar that provides natural energy. Amino acids, taste and texture come from soy proteins and sunflower oil contributes monounsaturated instead of trans fats. 25 micronutrients are contained in each serving of a Soylent drink, as opposed to other powder shakes that only focus on loading up on protein. 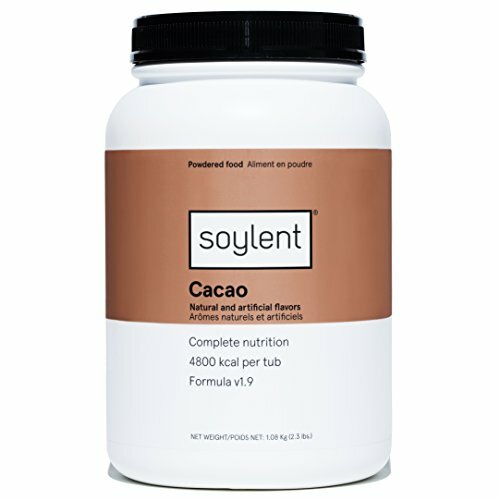 A focus on micronutrients makes the Soylent drink a balanced meal replacement option. The bottles are a convenient grab-and-go size; plus, they are designed to be easily recyclable, making the smooth textured and delicious drink both physically and environmentally healthy. There are some sugar additives, such as sucralose, that detract from the health of Soylent. However, despite these additives, the drink is still healthier than the alternative of a nonexistent or fast food lunch. 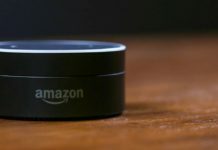 The company prides itself on using GMOs, and it is up to the consumer to form an opinion on the scientific issue of consuming genetically modified foods. Ingredients are not organic or GMO-free, which means some ingredients may have been grown using pesticides or herbicides. The top two ingredient concerns include natural flavors and sucralose. ‘Natural flavors’ are common on many other food labels and are usually composed of extracted flavors mixed with chemical compounds. Sucralose is an artificial sweetener that contributes to the nine grams of sugar in each serving. The opinion on the taste of Soylent is divided almost equally between those who do or do not like the taste. A majority of customers like the smooth texture of the drink more than the sometimes-crumbly taste of the powder. For those who do not like the taste of the drink, other ingredients can easily be added to improve it. The soy flavoring blends well with honey or fruits such as strawberries. This drink should not entirely replace a healthy diet because there are still a few nutrients unaccounted for, such as Omega-3s. The beverage is healthy and satisfying, leaving the consumer without sugar cravings and feeling full for three to five hours. In general, customers such as those who cannot eat solid food or who are seeking to lose weight are pleased with the product while stricter nutrient consumers, such as those on a paleo diet, seek other alternatives. Another popular meal replacement drink on the market today is Ample. Soylent and Ample both strive to create a convenient and healthy meal replacement option. Ample succeeds in including a wider range of vitamins by using more plant-based ingredients. Ample is also gluten-free but differs from Soylent by being non-GMO. When comparing ingredients and nutrients, Ample nudges ahead of Soylent by including health components such as Omega-3 and probiotics. The company offers three formula ‘flavors,’ including an original, a vegan and a ketogenic formula. However, the nutrition comes at a cost, with Ample being nearly twice as expensive as Soylent with a price of $6.50 per drink. Soylent is a less expensive and tastier option while remaining nutritious. When it comes to meal replacement drinks, Soylent delivers a successful product. It is nearly impossible to find a liquid shake that has the perfect blend of natural ingredients, calories and flavor, but this one comes close. When combined with a healthy lifestyle, this drink is an excellent option for those working toward weight goals. Do you have any experience using meal replacement drinks such as Soylent or Ample? If so, share your thoughts and opinions in the comment section below. The Soylent Meal Replacement Drink comes in two delicious flavors. Each scoop of powder consists of 200 calories filled with important nutrients to your daily diet. If you want to lose weight and keep track of your diet then this is a pretty great meal replacement for you. Previous articleTop Countries Where People Live the Longest: Why Do They Live Longer?